4pm and the afternoon sun's still in the yard. Can we, should we? Do you think it's too early? Oh, but it's your birthday, yes why not, I think we can, I think we should, even though it's only four o'clock. The sun's shining and yes it is your birthday. Get the jug, lets make a Pimms No.1 cup, no it's not half and half (!!) its 1:3, yes that's right it's one part Pimms to three parts lemonade, plenty of ice and a sprig of mint. A clink of glasses and Birthday wishes, we enjoy the most refreshing drink ever ever. 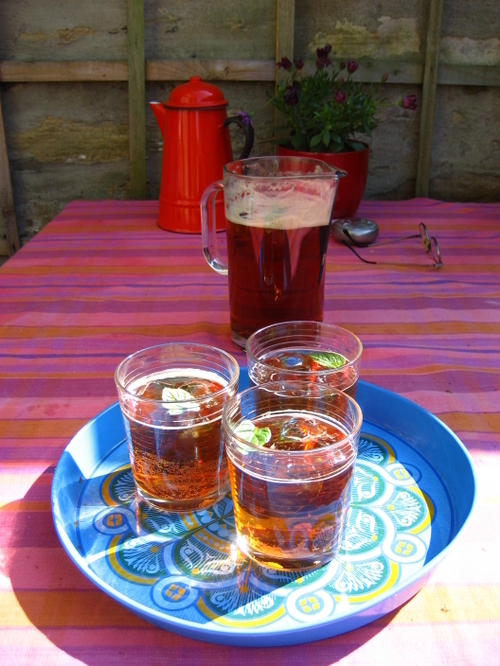 Happy Birthday C. Pimms in the sun :: most definitely-absolutely a reason to be cheerful. Oh, by the way, see the red enamel coffee pot there? A generous house-gift from my lovely house-guests, we went rooting round a local antiques shop yesterday morning and I fell in love with it. That and a bright red Lloyd Loom chair which I am hoping to purchase any time soon when I've whispered sweet nothings into J's ear. Don't know why but I never class Pimms as alcohol so the "before tea-time" rule doesn't apply! I was home alone last weekend when my neighbour called over the wall that she'd just made a jug of Pimms and would I like to share? Would I?? I nearly leapt over the 8 foot high wall and boy, was it a large jug, I slept well that night! Love the enamel coffee pot!